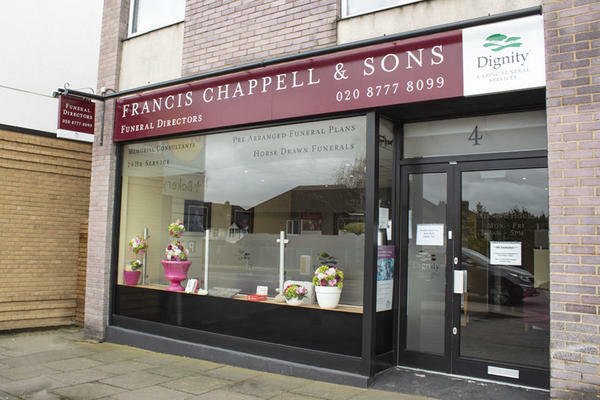 We are Francis Chappell & Sons Funeral Directors based in West Wickham. We are here to help you and your family by providing a bespoke funeral service to help you celebrate the life of your loved one in a meaningful way. We have been serving our local community since 1840, and we have built up extensive funeral expertise which allows us to conduct all kinds of funerals. Whatever kind of funeral you have in mind, we will be able to help make it happen. Working closely with you, we endeavour to get every detail just as you want it to be. We understand that losing a loved one can be difficult, and we want to offer you our full support. If you need any advice or guidance, or simply someone to speak to, we are here for you. You can reach us by telephone 24 hours a day. We are here for you, every step of the way. Please call us today on 020 8777 8099 at any hour. There is car parking available at the front of the branch and on surrounding streets. We are next door to Lidl at the Coney Hall end of the road. Our staff are available 24 hours a day on 020 8777 8099 if you require our services outside of these hours.